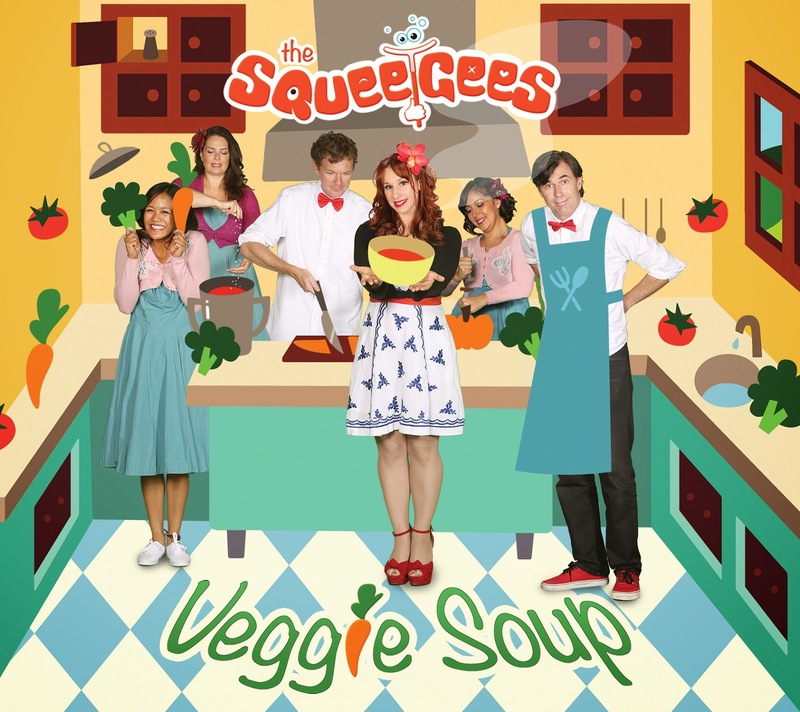 The Squeegees, an LA-based family music band, released their second album Veggie Soup this week. After listening and dancing to the music with my boys and one of their friends, I can recommend it as a happy, upbeat collection that you'll enjoy hearing along with your kids. The music itself will have your kids moving and expose them to styles such as tango, reggae, and a cappella along with The Squeegees regular folk/rock sound. "Rainy Day", the a cappella track, has some really nice vocal harmonies, and school-aged kids will exercise their listening skills as they check to make sure you're right when you tell them the music consists only of voices and snapping. Lyrics from Veggie Soup send positive messages about healthy eating, green living, learning Spanish, and believing in yourself. I really enjoyed "Clean Up" as a peppy and welcome alternative to the clean up song popularized by Barney. "Dancing" is a lively freeze dance with changing tempos, and "I can, I can" also contains instructions for movement. "Let's Count en Español" is a somewhat humorous tango introducing all sorts of Spanish words. Veggie Soup will add bounce and cheer to your day, entertain your children, and reinforce those lessons about responsible living that we all want them to learn so much. Watch The Squeegees perform "I Can, I Can" below and like them on Facebook for updates. For less than $10 you can buy the album on itunes or Amazon, or purchase individual tracks for 99 cents.